2018 Was Rough, But 2019 Shows Promise – We Got This! Our annual holiday (Christmas) cards were mailed a couple of days ago and, if you’re on our list, you should be expecting to receive it soon. Perhaps even as early as today. We mail these every year to those who helped Ryan, and my family, over the years. It’s important to us to let you know we haven’t forgotten. Truth is, we never will. We are constantly updating this list. Sadly, we realize that we surely missed people. Aside from this, we typically get around 100 cards returned; because people changed addresses, passed away, and various other reasons. We do our own research to correct it going forward. So, if you would like a card (beginning next year) or didn’t receive one this year that you were expecting then I’ll set-up a way to add/update your information in January. Please be watching for me to do this by visiting this website next month. Alternatively, you can send me an email. 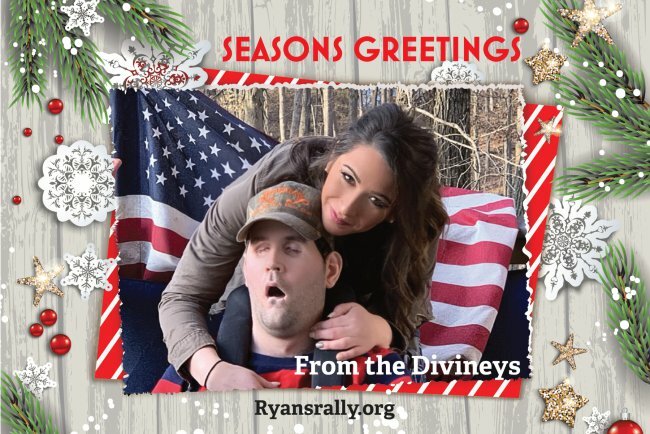 My address is kdiviney@ryansrally.org. To say it’s been a rough year falls shorts of justifying just how rough. Ryan was hospitalized twice for kidney failure, once in January and again in August. In total, he spent close to a month in the ICU/medical ward. Each time he was critical. It was touch-and-go and Ryan was teetering on the point of no return. It was, well, beyond scary. So much so that the last time it happened the kidney specialist asked, flat-out, if I wanted to continue his life if he didn’t show immediate signs of recovery soon. In September, my mother passed away in her home unexpectedly. We still don’t know the cause and likely never will. I was able to make it back to my hometown to say goodbye. She (and my dad) each planned for their passing in great detail. The services and gathering were beautiful and classy. It makes this holiday season sad in knowing that my dad is struggling. He was with her for 57 years and he must have had mixed emotions seeing her buried in the same dress she wore when she eloped with him. Despite the rough times, Ryan and my family did not relent. We refused to give up or give in. As I’ve said many times before, we lowered our shoulders and plowed through. Ryan is physically strong and healthy again! We work hard every day to give him the best chances. I’m proud of him. My daughter, Kari, keeps impressing me. She teaches special education at a nearby middle school while also getting her Masters in Education. She might be the most intuitively and practically intelligent person I know. I’m proud of her. My bride, Sue, changed jobs a while back and now rarely travels. You might recall that her previous job took her to New York City for two weeks out of every month. She is now based in Washington, D.C. where she is the Vice President of Finance (for a media company). More importantly, she is the joy of our family. I’m proud of her. As for me, well, I guess what’s most noteworthy is that I took responsibility for my personal health… after some highly concerning blood work results I had last year. I’m eating healthier and exercising. I lost over 60 pounds of body weight (then added 10 pounds back in muscle mass). This routine completely transformed my body, albeit back to the way it was before Ryan’s attack, with cardio exercises and strength training. I actually ran 7 marathons this year… in my basement. Next year seems promising. There are two annual fundraisers for Ryan that I always look forward to being held. The first one to occur will be in late-January (i.e., more information on this in a future post) by m college roommate, John Maletta. He’s been doing “Ride for Ryan” for years and this year it will take place in Florida. The other event will be held in early autumn. A good friend took over the annual golf fundraiser last year and completely transformed it by making it a local community gala that anyone, from anywhere, can take part. He rebranded it as “Tee It Up for Ryan Diviney”, so please know you are welcome to participate when it is held. As you know, to me, the most important aspect of this tragedy is to “keep Ryan relevant” and next year marks a decade since the brutal attack. In Ryan’s honor, my family is working with a production team to release an in-depth documentary (on November 7, 2019, the tenth anniversary). It will likely be titled Storming: The Ryan Diviney Story. The best way to explain this is that it will be an intimate portrayal of Ryan’s struggles, our challenges, and supporting narratives from medical experts, friends, and family. I even hope to get the low-life attackers (Jonathan May and Austin Vantrease) to have their say… but I’m not holding my breath. The documentary’s promotional trailer is expected to be released later this month or next month! So, good riddance to 2018. Here’s to a promising 2019! Hi Ken, I really can’t find all the words to express the amount of respect and admiration I have for you, Sue and Kari. As for Ryan, I have known a lot of very strong people in my time, but Ryan will always be the strongest person I have ever met. Sending my love and good thoughts to you and your beautiful family, and as always I remain, still here and still praying. I’m so glad to hear Ryan is doing better and that you are seeing to your own needs. Sending positive thoughts for a peaceful holiday season for you and yours. This brought me to tears. I have no words except “Still here.” Sending you all love and support. For some reason, Facebook deleted your page from my thread and i did not realize it until one day Ryan popped in my thoughts and i wondered why I hadn’t been getting your updates. I fixed the problem and have you back on my Facebook account. As I read your post today, it made me reflect on some of the issues I’ve been facing recently and I had a little chat with myself that I need to put my issues in perspective. There are so many people in this world dealing with much worse and I thank you for helping me to remember this always. You and your families strength and dedication is nothing less than AMAZING! My sympathies to you for the loss of your Mom. I do know how that feels unfortunately. I lost both my parents far to early in their and my life. Knowing they are together and with God gives me peace but it’s still hard to not have them here with me. I’m very excited that your wife found a job that will allow her to be home with you and Ryan. Congratulations to your daughter for her success. I will continue to pray and keep Ryan, you and your family in my thoughts. Your day to day life has reminded me that we don’t quit when things get us down, we fight, we don’t allow ourselves to fall. I know your posts don’t just remind me of this but so many others. You and your family have taught me and others so much from your strength, love, and hope. Wishing you and your family a very Merry Christmas and a Happy New Year. Just don’t know what to say except that your family is such an inspiration. Knowing what a terrible injustice that Ryan has suffered, makes me sick to my stomach and knowing that the persons responsible have never been held accountable to any degree that they deserve to be….makes me even sicker. Ryan amazes us all. He has fought through so much and his overall health shows just what wonderful caregivers he has in his life. So glad to hear that Ryan’s mom can be home more, since she’s changed jobs. That has to have been the toughest part of all for her and your whole family, to not be able to be all together all these years through Ryan’s recovery. My prayers for all, and always a prayer for a miracle for Ryan ❤️ and Merry Christmas to your family. A decade! That is a testament to the toughness of your family that Ryan has survived and is doing as good as he is after 10 years. I hope the documentary spreads the word about not only Ryan, but the two criminals that did this to him and your family. You are always in our thoughts and prayers. So sorry about your mother and prayers your way for your dad. Hope your Christmas season brings some rest and joy your way. Merry Christmas Ken, Sue, Kari and Ryan! So thankful Ryan was able to get through those two episodes of kidney failure this past year. I have no doubt it was due to your remarkable diligence in keeping him on such an incredible fitness routine. I’m also glad you were able to get to your mother’s funeral. I know that leaving Ryan for even a moment pains you, but thankful you were able to pull away briefly to say goodbye. As always, you, Sue, Ryan and Kari remain in my daily prayers. Thinking of all of you over the holidays and always. Wishing you an improved 2019! Thanks for taking the time to write an update, and so glad Ryan is doing better.